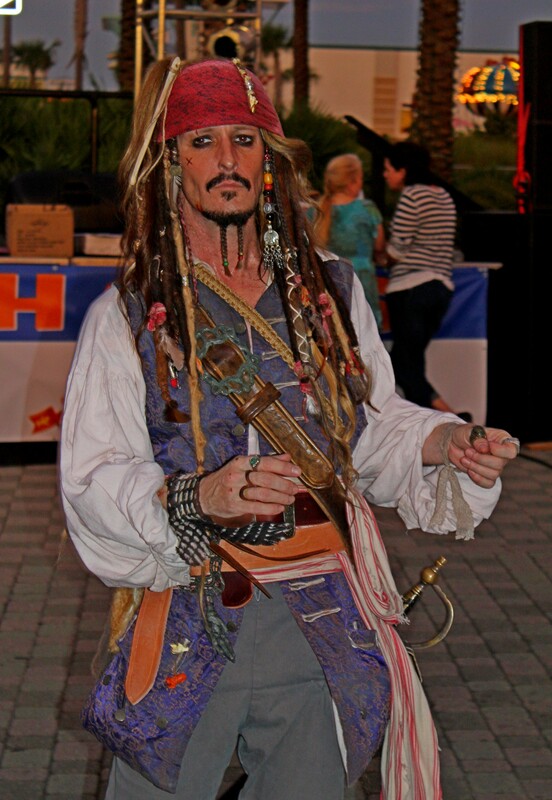 I snapped this very reasonable facsimile of Captain Jack at the annual pirate festival in Panama City Beach last weekend. He prissily swaggered like he owned the town and was accompanied by a horde of rowdy sailors, madams and handfuls of pirate kids who had pretend sword fights along the way. It was by chance that my family chose to head south for some sun and surf on the very weekend of the annual Pirate Festival. During the day, we hung out along the ocean, the pool, the shops, the restaurants, and by evening, enjoyed the festivities. There were parades, fireworks, and armfuls of free booty (Mardi Gras necklaces) for anyone willing to scream their heart out for attention from smiling pirate ladies riding pirate ship-like parade floats. One night, the sponsors gave away 12,000 beach balls suspended in giant nets above the crowds. The balls fell at the same time and kids AND adults made a mad scramble to grab as many as they could. My girls were quick and grabbed one each and the balls are now prized possessions back here in KY. It was a good time of year to go the ocean. We didn’t get sunburned. Found a great off-season rate on a suite and I could relax to live music in the evenings. Glad we went.